Hungry for Change? Texans apparently are ready for laws that keep gaming dollars in their cash-starved state. Gaming legislation will again be on the agenda in Pokerati’s beloved home state of Texas — as it has been pretty much continuously since the days when “blue laws” prohibited us from shopping on Sundays. But this year Texas is friggin’ near-broke and public opposition to gambling is minimal, making hopes for passage of new gaming laws more promising. 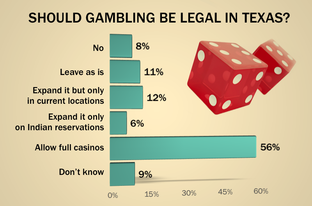 A poll of registered voters taken earlier this month (conducted by the University of Texas and Texas Tribune) indicates 56 percent support full-on casino resorts in Texas, and fewer than 20 percent oppose any expansion of gambling or want to ban it altogether. A year ago, these numbers stood at 40 and 31 percent, respectively. Meanwhile, state lawmakers are wrangling with one of the biggest budget deficits in the country and the need for contentious cuts to education, Medicare, veterans affairs, prisons … and just about every other department in an effort to close a budget shortfall estimated at $11-to-27 billion — bigger than any the state has ever had to face. In what is arguably nearly as compelling drama, in the above vid Rep. Jose Menendez delivers last rites to HB 222 — but not before being ridiculed and taunted with terrible poker metaphors (delivered in practically Corky-like fashion) from the representatives who were ready to lead the fight against this bill on the floor. While Texas poker players pushing for fully legal Texas Hold’em did not get the House vote they were looking for, Menendez’s address does mark the first time the game was ever made a real issue in the Texas Legislature. Having achieved such footnote status in the historical almanac, the insinuation on where we go from here is that next time both sides should gear up for a full-on battle spirited debate over a bill looking to create California-style card rooms … in a year where the threat of a veto carries less weight, no less. Rep. Menendez has officially killed HB 222 on the floor of the Texas House, knowing that the Gov. won’t pass. He was able to spend a few minutes discussing why it should be allowed to proceed, only to be interrupted by several bad poker-related puns. Texas Gov. Perry is blocking the vote on HB222 (the bill that legalized land-based poker in Texas).Â Let’s all amp up the pressure! I believe we should hit with calls and Twitters.Â This was effective at getting us heard in Minn., so let’s try it here.Â I wrote up some Tweets to Twitter.Â It takes just seconds to send these out, so let’s all pitch in! I posted this to P5s at http://www.pocketfives.com/poker-forums/7/new-letter-to-congress-please-send-4240404 and http://www.pocketfives.com/poker-forums/8/texas-poker-legalization-people-living-in-texas-plz-read-4204172 .Â If you get a chance, please consider posting a message of encouragement there to get others to pitch in.Â After all, 2+2 responded to this by giving me a warning; P5s responded by stickying my thread for the day (I didn’t ask them to). I swear this won’t tilt anybody … but here’s the alert sent out Thursday by Texans Against Gambling to generate enough support for a change of course that, frankly, I still don’t fully understand. Weston Ware, legislative director for Texans Against Gambling, issued this statement today regarding House Bill 222, which legalizes poker, including electronic poker, in Texas. The bill was voted out of Calendars Committee on Thursday and will be scheduled for a floor vote. â€œThis bill is not about legalizing poker games with friends around the kitchen table. It is a ploy by the pro-gambling industry to crack Texasâ€™ constitutional ban against gambling by making the absurd argument that poker is not a game of chance, but of skill. â€œThe next time someone uses their skill as a player to get dealt three-of-a-kind, call me. â€œHB 222, among other things, would allow electronic poker tables to operate 24/7 in bars and restaurants. These Class III gambling devices mimic the addictive qualities of slot machines based on the speed of play (a good player can go through as many as 12 hands a minute).They have the ability to keep players playing (many video-poker outlets are open 24 hours and itâ€™s not unusual to hear of someoneâ€™s playing 36 hours straight). Also, the machines are designed to create the false perception that skill is involved in what is ultimately a game of chance. Bringing up “dead bill” = bad process — use up valuable HouseRep time for bill destined for veto, thereby preventing colleagues from getting to their bills. still have/need [illegible … something shot at … casino bill] … 100 votes [something with a C] … next year]. light up the governor’s office with message that I’m a Texas poker player who votes and want to be able to play safely and legally in Texas. Ahh, right, OK … I think I get it. May need to do a follow-up to clarify some of the above. Here’s what we’re up against … I don’t want to alert them that we’re out here trying to muster up the troops … but the “Shmristian Shmlife Association” put out this memo in an attempt to deliver us a bad beat. Also, you can go to [ texans against gambling dot org — alloneword] to see how they are suddenly putting this issue front and center. Subject: Governor Perry blocking vote on poker bill-Please call now! Earlier today the Texas House of Representatives was scheduled to vote on HB 222 â€“- a bill that would license and regulate poker in the state of Texas. I have since learned that this historic moment is being blocked by the Governor Rick Perry. Â· Texans should be allowed to play Texas Holdâ€™em. Bad river card on its way? I’m following the Texas House here. (Boring, not fun.) And all I can say is I think I’m heartbroken before we’re even rollin’. Jose Menendez (D-San Antonio), do we even know you anymore? Supposedly Gov. Rick Perry has re-re-changed his position … and so now Menendez is going to not even let the House have their vote? I honestly just don’t understand. We weren’t getting out of that damn calendars committee without his tacit thumbs-up. We got that, no? But now it’s gone? And even if so … why not force him to veto it … put his political aspirations on the line with international press CardPlayer Italia watching? I know I’m just the political sophomore rookie here, but would he really be willing to go against more than 2/3 of the general voting populace? I’m going to add rick.perry@governor.state.tx.us to my CC … just by chance that gets to him more directly. As Kevin noticed early this AM (before my post from yesterday doubting the notion went live), Texas’ HB 222 has moved out of the Calendars Committee and is scheduled for a vote on the House floor tomorrow … which means it really should happen by Tuesday at the latest. Woot! Started to get worried there for a bit, but thanks to readers like you and probably the PPA and many others helping the capitol hallway soldiers … The People of Texas, man! … Step 3 of 6 has been successfully completed. You can see we still have a long ways to go, but Steps 4 and 5 have to be done for sure by May 23, so this is it … we’re about to see if our hard work first steps in the process properly position us to make it through the next all-important three. And by all means, we have to go undefeated … one loss and we’re dead. Go here or here to send the whole House of Representatives an email letting them know you hear they’ll be voting on HB 222, and that you will really admire them for seeing the sensibility of this legislation. To put a final nail into the coffin of [any] argument against HB222, I was at a Austin poker game last night and we got robbed at gun point (5/7/09, early morning). It was in a nice neighborhood and is known to regulars as FPC. At least two people got beat up. Weâ€™re all lucky to be alive. The Travis county sherrif was called and filed a report. This is the week … that’s what I’ve hearing from people in Austin and DC regarding legalized racetrack (and Indian Casino) poker in Texas. All seem to be staying on message, too, because that’s the same thing they were saying last week.